The second fanart contest which began on March 31th, 2005 finished with three wonderful drawings. Congratulations to Usako for this beautiful image inspired by the manga. Thank you Aleksandra for this wonderful image! 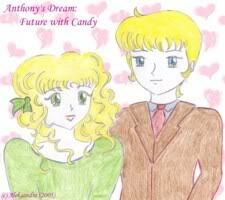 Finally, another beautiful image of Candy and Anthony in the modern world.